I have been a fan of Julie's for years. The first of Julie's books I ever bought was her cupcake book, way back in 2005! 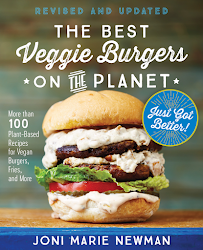 And each and every book she has put out since has been even better, so you can only imagine how excited I was to get my hand on a book full of recipes for vegan pizza! Yeah, I was pretty excited. And now the wait is over. 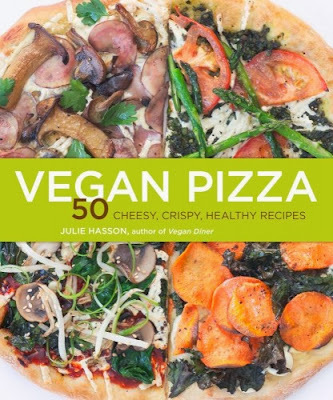 Julie's new book, Vegan Pizza: 50 Cheesy, Crispy, Healthy Recipes in finally in my hot little hands. And I was so excited about it, I bought 2 copies! So now I have one to give away to one of you. Just follow the prompts in the widget below to enter to win. Since I am sending it out, this contest is open to anyone, worldwide! Now on to the book review. 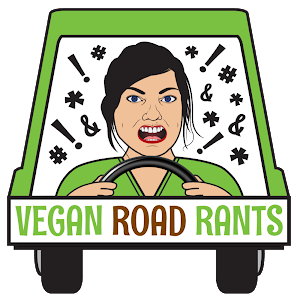 The intro is sweet and Julie tells us about her personal love affair with pizza and how her transition to veganism had her rethinking her pizza making. Then she teaches us how to stock our pantry with all of the vegan pizza necessities. Moving on, there are tips and techniques for making the perfect pie, and then...it's on to the recipes! She starts us out with plenty of different dough recipes, including my favorite kind of pizza dough, that I never make myself, but now I can, Cornmeal Dough (page 12), then she blows my mind with a whole chapter on house made meats....wha-wha-what? This lady is reading my mind! Faux-meaty are some of my favorite recipes in the world, and now I have 6 new meaty ways to top my pizzas. Next up are the cheesy sauces and spreads. 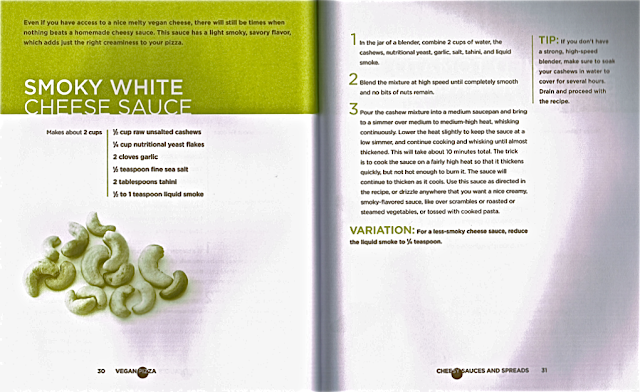 Yep, a chapter devoted to making your own delicious creamy and zesty sauces. My favorite? The Smoky White Cheese Sauce (page 30). Now, with just these recipes, there is enough ammo to make an abundance of delicious pizzas, and we haven't even gotten to the recipes for entire pizzas yet! Components taken care of, Julie now gives us the recipes for all sorts of pizzas, from pizzaria classics, to those inspired by the fresh bounty at the farmer's market. And then it gets really creative! 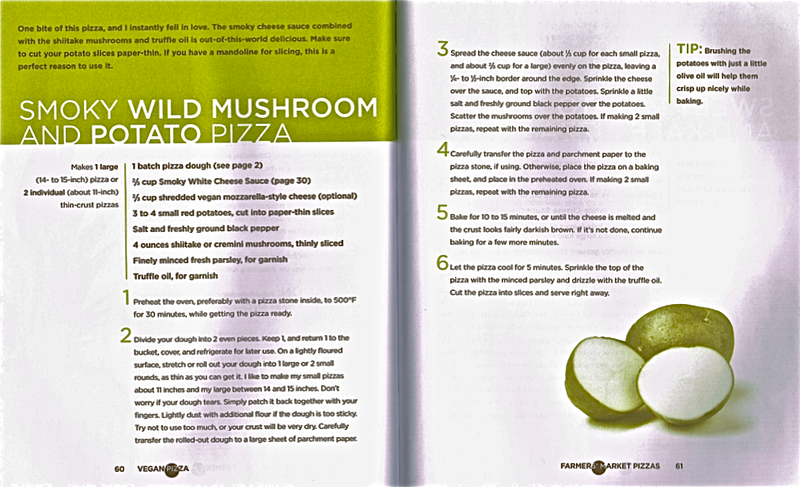 Cheeseburger Pizza, complete with dill pickles (page 72), Bibimbap Pizza (page 88), and she even finishes with some sweet pizzas for dessert...Coconut Caramel Pizza (page 107) anyone? 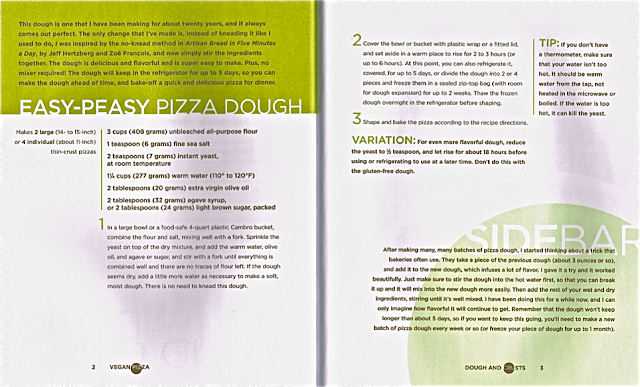 This book is smartly laid out with easy to follow recipes, sidebars and variations giving more in depth info on the recipes, and the recipes almost all nicely fit on a 1-2 page layout, so there is no page flipping in the middle of your pizza making. In the back of the book, Julie offers up some useful resources and metric conversions, and a user friendly index. The only thing missing is the full color photos. But seriously, how many different ways can you take a picture of a pizza? Besides, Julie posts lots of pictures on her flickr photostream and on her website to give us a good idea on what these amazing pies (as well as lots of other yummy foods she makes) should look like. Get yourself a copy of this book! 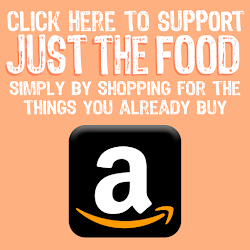 Even if you aren't vegan, or even vegetarian, because knowing how to make a pizza from scratch, at home, is something every home cook should know, and Julie can teach you how to do it with no fear and no hassle. This book gets two thumbs up from me. Julie also was kind enough to share a recipe to get you excited about the book. And, lucky for you guys, it features the The Smoky White Cheese Sauce I mentioned above! yeah! I already have a copy of this book and I can't wait to get to work makin' some pizza! Just a couple more days of mofo and I'll be a free agent in the kitchen! ha ha. I love Julie's recipes so much, and I am also totally stoked about all the faux meats recipes. Can't wait!! I love making my own pizza, but one of my favourite ever pizzas came from a little pizza truck at a festival with its own wood fired oven. Hold the cheese and lots of veggies - so tasty! This looks so good! Also delighted it's an international give-away. Thanks for that. I've been waiting for this book. Dying to read it! But still I love it homemade, though I have to admit that I sometimes buy a premade pizza dough. But I'm definitely gonna try the recipe above. I haven't liked any of the vegan pizzas I've tried to have a favorite. I'm looking forward to this book to change that. I made a really good one that had spinach, sun dried tomatoes, plum tomatoes, pickles, mushrooms, garlic, and vegan kielbasa. I really like making pizza so home made all the way. Just plain with FYH mozz or with garlic olives and roasted red peppers. Homemade = yum. So much creative possibility! I've always been a sucker for spinach, broccoli and mushroom pizza - yum! Homemade is always great! Especially when choices are limited with takeout or store bought. Add that to how expensive it can be. This book sounds like what I need to expand my choices!! I love making homemade pizzas (just made one last night) and can only imagine all the fun we could have making pizzas from this book! My favorite vegan pizza is certainly homemade style with Greek flavors; spinach, kalamata olive, red onion, tomatoes...miammm and with Daiya cheese. I like Amy's vegan pizzas, doctored up with fresh herbs and sriracha. Homemade we live in a SUPER small town that's about as meat and cheese as you can get so it's much easier to do it yourself! My favorite pizza is always going to be regular cheese pizza. It's a classic. I love homemade pizza, but honestly, my homemade pizza isn't as good as restaurant pizza. Maybe this book could change that?!? Can't wait to try out the smoky cheese sauce! My favorite pizza is homemade taco pizza! 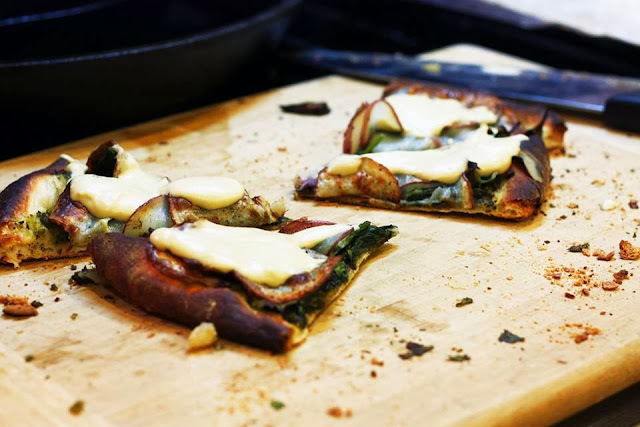 This cookbook sounds fantastic, I love making my own pizza bases and crazy toppings. we love making homemade with pestos of all sorts! Homemade is always my favorite, hands down. Right now I'm eating a lot of pizza with rocket pesto as a base, and topped with locally grown shiitakes and heirloom potatoes! Restaurant! I rarely have the energy to make all the components of a good pizza. Faves that come to mind are PF Pizza Co in Reno and Zachary's in Oakland. What amazed me, 18 months ago when I took the plunge into being vegan, was how much I enjoyed pizza WITHOUT cheese! I like a whole wheat crust, topped with red sauce, artichoke hearts, roasted garlic, olives, mushrooms and red peppers. I love any pizza made with a whole wheat crust and lots of grilled veggies, sans the cheese! My favourite has got to be a thick wholewheat crust topped with sun dried tomato paste or pesto and lots of Mediterranean veggies. I've had some amazing pizza from Viva Pizza in NYC! How lucky I am to find this! Thanks for sharing this. I currently finding some related stuffs related to this.